We’re still planning on having a flower-free wedding. While I figured there are plenty of flower-free bouquet alternatives for me and the bridesmaids, when I thought about the number of people in the Bridal Hootenanny I got more nervous. Then I found out that my mother-in-law Viki has boxes upon boxes of jewelry for use in her art, and was willing to let me poach from this bounty for the bouquets etc. 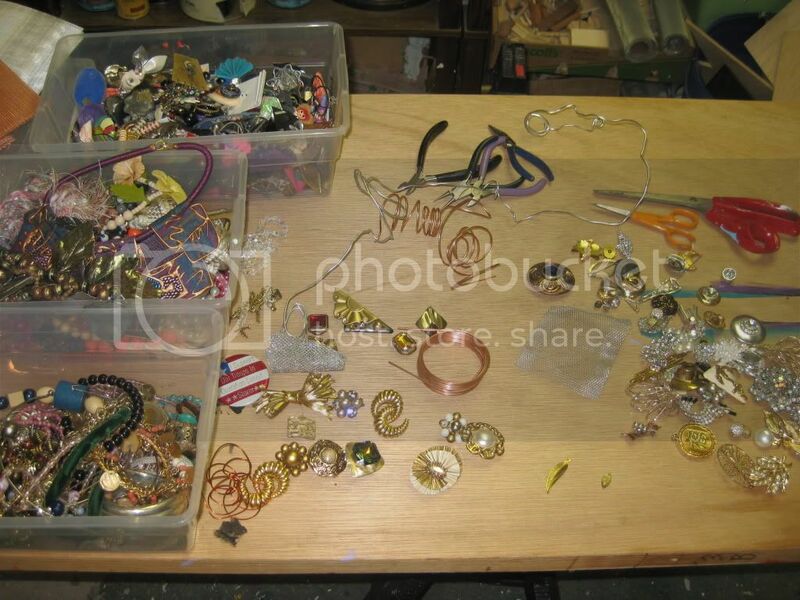 I took three gallon-sized ziplock bags of brooches, earrings, wires, beads, and bits of scrap metal. I am so ridiculously Stage One about this stuff. 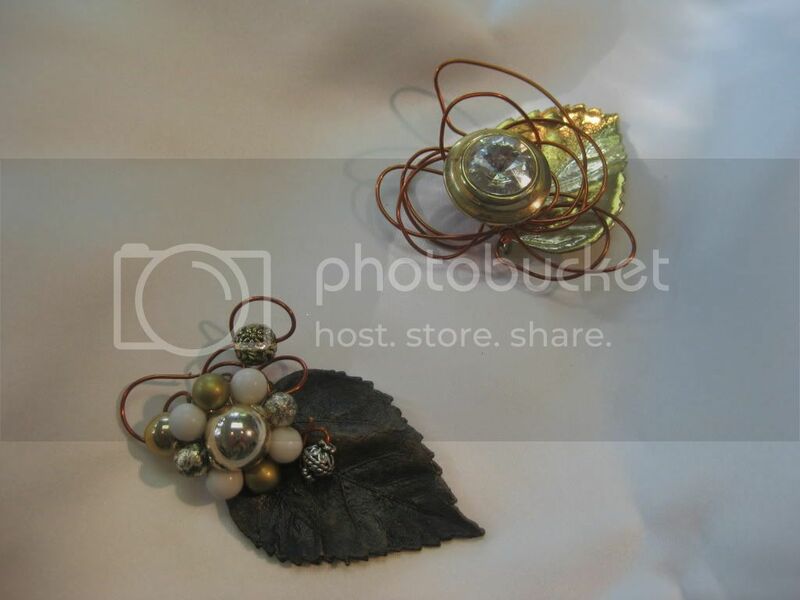 So here’s a little tease: two proto-boutonnieres we made last weekend. Carrie, my future-sister-in-law who is also an artist, added the leaves, which I think really pull the pieces together. Please note that these are held together by gravity and that I never gave a second of thought as to how these would go through the boutonniere hole (is there a technical term for that? Also, suits don’t have those, do they? Do people in suits not wear boutonnieres? ), so the finished product that has to take practical considerations into account may look quite different. My suit is a Calvin Klein 3-piece number, so I don’t know if it is a fair representative, but it does indeed have a hole for a boutonnière. “hole for a boutonnière” is so formal, though – I choose to devolve and call it “a bouti-hole”. Or, (as I’ve just learned) as the French call it, a buttonhole (well, “boutonnière”, but it’s a literal translation). Nice bouts. And much less lazy than my approach! I really like your approach to spelling bout! I am completely lazy about spelling words that require me to go to Word, insert a symbol, and then cut and paste it. Way, way too much effort for one effing word. LOVE non-flower bouquets! I’m borderline (OK this is a safe space, 110%) obsessed with mine. They are one of my absolute favorite things about my wedding, and I guarantee you that you will NOT regret making these! So excited and please please PLEASE keep us posted!